I can’t believe Thanksgiving is just one week away! It really did just sneak up on me this year. I’ve been so busy getting everything together for the new house that It kind of just hit me that it’s next week! If you are looking for ideas on what to wear on Thanksgiving Day? I put together these three looks to get you started on your hunt. The weather here in Houston is going to be a little chilly, which I am excited about. Hopefully I will be able to bring out some light sweaters and knee high boots that weekend. As I’ve mentioned before, I will be hosting Thanksgiving dinner at my house this year. My style will be more on the casual side with a pair of jeans, cute top, and a pair of flats. I bought this puff sleeve top at Ann Taylor a couple of weeks ago. I haven’t worn it yet so I think it will be perfect for Thanksgiving night. For jeans, I am going with this Wit and Wisdom pair that I absolutely love! They are so flattering and comfortable and they don’t lose their shape. If I was headed out to someone else’s home for dinner, I would probably go with a nice sweater dress and some boots. 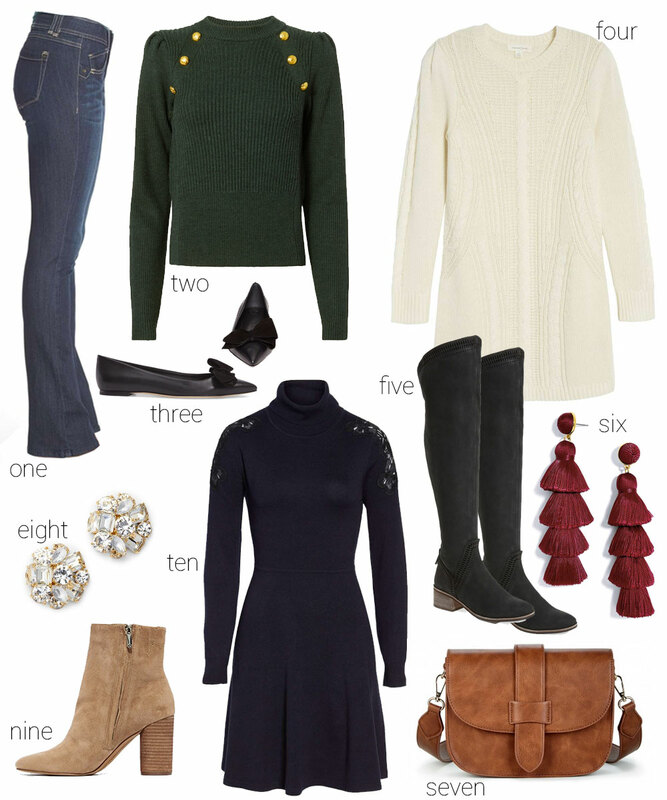 This traditional style sweater dress comes in both navy and off white and pairs perfectly with a pair of knee high boots. You could always add some tights to it as well. I also really like the style of the navy sweater dress pictured above. It has a nice lace detail on the shoulder and is under $100.